Losing a bit of sight on their bumpy season, Mt. Hebron’s Varsity boys’ basketball team ended their regular season with an overall record of 14-8. Boasting wins over Glenelg, River Hill, Atholton, Howard and Marriotts Ridge, the men have much to walk away with. Eight games into the season, the team was on track to make it big within the county until Jan. 7 when they met face-to-face with the then-undefeated Centennial for their biggest home game of the year. 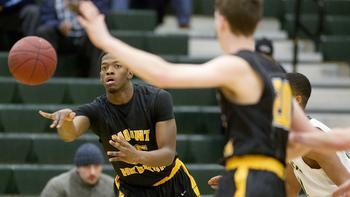 It was a pivotal matchup between two of the top three teams in the county. With Mt. Hebron’s gymnasium packed to the brim, all bets were off. But by the end of the night, the Vikings were handed a tough loss that subsequently snapped their seven-game winning streak. After that, the Varsity boys lost a certain spark that generated the first half of the season. In an attempt to push the team back on track, captain and senior Mark Smith kept his head straight, focusing on what he and his team could do to finish the full season strong. “We need to get that competitive edge back and stop relying on our shooting and talent to win us games,” Smith said before the season ended. Senior Josh Bryant follows through with a crisp pass to a teammate, while fellow senior Mark Smith finds open space to prepare himself for a possible jumper (Photo Courtesy of Jen Rynda / Baltimore Sun Media Group). Smith became quite the star player on this year’s squad. Averaging 16.3 points per game, Smith made a name for himself not only in the school, but also in the entire county. Being a specialist from outside the arc, Smith had no problem knocking down three-pointers with or without a man in his face. Having 55 three-pointers knocked down this season, Smith is not new to this. 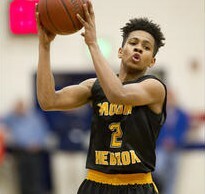 Smith accumulated an astonishing 155 three-pointers in just a mere 68 games since he joined the Varsity squad his sophomore year. A key return for the Vikings, senior Joey Trapuzzano missed nearly half the season recovering from a pre-season knee injury but bounced straight back into his rhythm, gaining more playing time in each consecutive game. The senior point guard continued to be a triple threat on the court. He was able to dish the ball effectively, take it to the hoop, and even practice his long-range ability, all skills that he demonstrated since his mid-season return. Senior Aaren Smith continued to push the team forward with his innate rebounding abilities that wreaked havoc against opponents this season. Averaging nearly double-digits in rebounds this season, Smith used his tall stature and long arms to out-reach most opponents going up for boards. Besides being a threat down low, Smith was also a very effective shooter inside and outside of the paint, averaging nearly 16.6 points per game this season. Although the regular season did not end as well as Mt. Hebron had planned, the men took great opportunities and capitalized in a few big games. With a portion of the team graduating this May, there will be rising seniors that will be key to next season’s squad. Madden was a threat off the bench this season, seizing every opportunity possible when put in position. Having the agility and toughness that is needed to play down low, Madden was a key player because he was not afraid to get off his feet and snag boards when they are most needed. After being benched most of this year because of a finger injury, junior Michael Carbonetti is bound to be back next winter. An aggressive player in every respect, Carbonetti does not stop until the whistle is blown. The team will need his ferocious passion on next year’s team. “Johnny [Linsenmeyer] and Lance are going to be our main scorers, so I’m hoping to be another contributor that can help those two carry the load offensively,” Carbonetti said. Freshman Cleveland Horton III prepares to make a move on a Wilde Lake defender (Photo courtesy of Jen Rynda / Baltimore Sun Media Group). Another key returning player for next year’s squad is freshman Cleveland Horton III. Being the only freshman on this year’s Varsity boys’ team, Horton gained immense knowledge on and off the high school court. As a ball-handling specialist, Horton has seen a fair amount of playing time this season, earning minutes in multiple games. It is worth noting that all season he sat behind senior veterans Connor Maloney and Trapuzzano. Playing time is not only what cultivates an athlete of Horton’s caliber; the process of maturing on and off the court, learning his role on the team, and putting in the work behind closed doors also makes a difference. “I believe I can add intensity to [next year’s] team and also I can make the team more of a defensive threat,” Horton said. Horton III is a big kid with a very bright future. Much of this development in his skill level can be attributed to long-time Varsity coach and Social Studies teacher Mr. Mike Linsenmeyer. The squad headed into the first round of the playoffs on Feb. 27, holding home court advantage over Digital Harbor, whom they comfortably defeated in the first round of the playoffs last year, 57-44. However, the Vikings were eliminated from the playoffs after a devastating loss of 59-58. Nevertheless, the boys can be proud of an outstanding season and look forward to the return of a strong and experienced team next year.